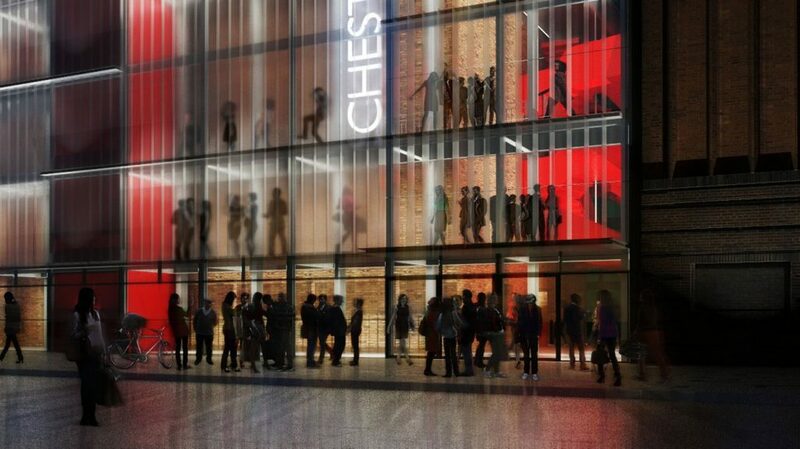 Chester’s new Cultural Centre provides two theatres, a cinema and a public library in the historic centre of the city. The project incorporates a listed shell of a former Odeon cinema and a new brick and translucent glass extension, with the library, café and 100-seat cinema screen being housed in the former cinema’s streamlined art-deco interior and the 800-seat main auditorium, 150-seat flexible studio and shared backstage facilities being housed in the new extension. The former cinema volume with its surviving plasterwork will become the main public focus of the building with a daytime café and library spaces on two levels and a 100-seat cinema screen which forms a free-standing glass-clad volume within the space. At night, the space transforms into the theatre foyer and bar, with film projection taking place onto a new screen flown into the old proscenium arch. Theatre audiences pass through and under the cinema screen to access the main auditorium which is housed in a brick-clad volume surrounded flanked open stairs and walkways which are visible from the street through translucent glass cladding. The main theatre seats 800 in a traditional end-stage format with a stalls level and two balconies. 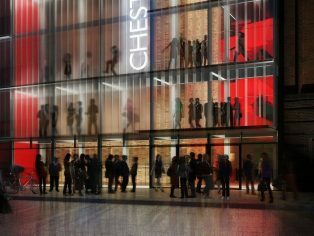 During the summer months, a thrust stage will be built above the stalls and the theatre converts into an intimate 500-seat venue which will be the natural home for Chester’s summer festival programme of Shakespeare, new writing, chamber music and spoken word performance. Above the main auditorium, a versatile studio space seats 150 and can double-up as a rehearsal or events space with its own catering facilities and rooftop bar with panoramic views over the city. Chester Odeon was built in 1936, designed by the office of Harry Weedon it was one of the first generation of super-cinemas with a large single screen seating 1600 on two levels. The Odeon chain had become well-known for their use of modern design to promote their expanding brand, but the planning authorities in Chester demanded a brick exterior, and the result was a powerful composition of volumes with a series of horizontal and vertical elements executed in finely detailed and textured brickwork with steel framed windows. The interior was unconstrained by planning regulations and as a result the foyer spaces and main auditorium were finished in the ‘streamlined moderne’ style with fibrous plaster covings and concealed neon lighting. In the 1970s the cinema was divided into three screens, and further divided in the 1980s to form five screens. These changes resulted in the loss of much of the original balcony detailing leaving original plasterwork only in the foyers and front of the original screen. The cinema was listed Grade 2 in 1989.